FO Brett Ramirez starts the walk-around check on N707HE with the assistance of JP prior to our departure to EL Salvador. In the 1990s the number of classic jets gracing the skies around the world was already in decline. With noise regulations becoming ever more stringent and the airlines always driving for more efficiency and lower operating costs, older airplanes were being withdrawn at a rapid rate. Opportunities to fly on these wonderful airplanes were becoming increasingly scarce as they were removed from passenger service and stored in the desert, or converted to freighters to continue their careers hauling cargo in the small hours to obscure destinations. Miami, Florida in the late 1990s was one of the strongholds of these ageing but charismatic machines. A varied assortment of 4 engined jets and piston-engined airplanes flew a regular schedule of cargo flights from the infamous north side off NW 36th Street. DC-6s, DC-7s, DC-8s and Boeing 707s were gathered here in what seemed like a concerted and defiant effort to keep these airplanes in the air no matter what. Surrounded by spare engines, maintenance ladders, scissor lifts, GPUs and dripping oil and hydraulic fluid, this was a classic airplane enthusiasts paradise. On vacation in Florida in March 1996 it seemed to me this would be the ideal time and place to try and get a ride on an airplane which was a favourite of mine but had so far eluded me - the Boeing 707. Thanks to the helpful folks at Challenge Air Cargo this proved somewhat easier than I thought. Along with my ATC colleague and vacation companion JP, we called in at the Challenge Ops office just of NW 36th Street one morning and politely presented our case and ID credentials. "Sure" replied the ops scheduler "where d'you wanna go?" A study of their ops whiteboard on the office wall revealed the majority of destinations to be in South America, so we asked him for a recommendation. "Well I guess El Salvador will be interesting for you guys" he said. We were asked to report back at 4pm that afternoon for our trip to El Salvador. Take off was scheduled at 5.30pm and a late night return back to Miami. We couldn't wait. N707HE on the ramp at Miami being loaded for the flight to El Salvador, whilst the FO conducts the walk-around check prior to departure. Back at Challenge Ops later that afternoon, we were greeted by Captain Carlos "Charlie" Frias. Charlie offered us a warm welcome and explained the details of the trip. He was not actually flying this time, but as the chief pilot at Challenge he was conducting a regular line-check on the Captain for the flight - Carlos "Speedy" Gonzalez. Charlies flying career started in Peru in the early 1960s, and he had flown some pretty interesting airplanes, including being a Captain and instructor pilot on the Convair CV990 Coronado for APSA airlines in Peru. Our destination that afternoon was EL Salvador in South America - we were flying to the main airport 30 miles outside of San Salvador, the nations capital city. Flying time was to be around two and a half hours, and we had a cargo load which included auto-parts, construction equipment and newspapers. After a walk around with FO Brett Ramirez and a take-off briefing with Carlos, we taxied out and were airborne from Miamis runway 09L at 5.25pm local time as "Challenge 49", en-route to South America. Established at a cruise altitude of FL350 and with the sun setting off the starboard side, Captain Carlos Gonzalez and FO Brett Ramirez consult their charts and look ahead to the descent and approach briefing into EL Salvador. Our routing took us south west from Florida, overhead the western extent of the island of Cuba, and across the western Caribbean Sea before crossing the northern coast of Honduras. The descent into El Salvador involves several step-downs to avoid the mountainous areas to the north of the city, so particular attention was paid to the minimum sector altitudes (MSAs) on the approach plates during the arrival briefing. The airfield is only just above sea level (elevation is 100 feet) but the MSAs to the north are up to 11,000 feet. Snap shot from the Jeppesen approach plate for MSLP showing the high level MSAs to the north due to the mountains along the border with Honduras. The airfield at El Salvador is relatively new - it only opened in January 1980, and so is comparatively well equipped compared to many South American destinations. The approach procedure led us to an ILS final approach to runway 07, landing at 1945 pm local time after a 2 hour 20 minute flight from Miami. N707HE parked stand one on the ramp at El Salvador. 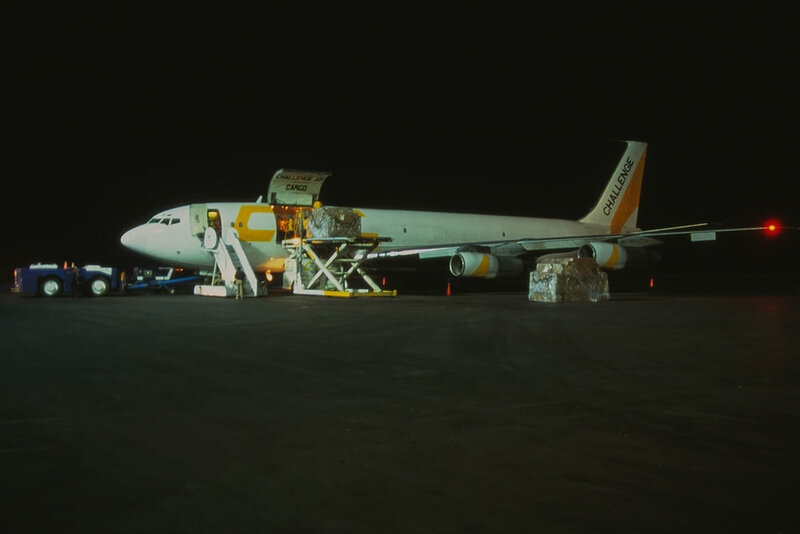 The airplane was loaded with local produce such as vegetables, spices and fish for the return trip to Miami - this would be transported to stores ready for sale the next day. The loading crew worked hard to turn the cargo loads around in just over an hour. In the meantime Charlie treated us and the flight crew to dinner in the terminal café. He recommended the local steak and refried beans - it was delicious. Returning to our airplane, the loading process was just being finished, and we helped to throw dozens of iced soda drinks down to the loading crew before shutting the cargo door prior to departure. I guessed this was a gesture of thanks, but Charlie explained there was more to it than that. Peoples wages down in South America were very little compared to back home in the USA, and even a few cans of Coke from the crews supply in their icebox meant a great deal to them when their days pay may only be a few dollars. Charlie had grown up in Peru and spent a lot of his flying career there - he knew how dire the economy was. I'd never seen this kind of economic differential first hand before, and that thought stayed with me when we checked into our $150 a night hotel later the next day. Departing El Salvadors runway 07 at 9.15 pm as "Challenge 50", a right turn after take off enabled our heavy jet to gain altitude to meet the step climb requirements of the standard instrument departure (SID), and ensure separation from the mountains as we turned north. Once clear of the Honduras coastline and out over the western Caribbean Sea, in the dark below we could see groups of lights - these were the lights of hundreds of small fishing boats on the water. There were so many bundles of lights stretching in either direction it looked like we were still over land. A noise preferential arrival over the everglades saw us arrive back at Miami on runway 09L at 2325 pm local time after a 2 hour 10 minute flight back from El Salvador. After taxiing back to the Challenge ramp the airplane was shut down just before midnight. We thanked Charlie and his crew for a wonderful experience, said our "thank yous" to the ops office, and headed back to our hotel feeling very fortunate to have finally flown on such a classic. Boeing 707 N707HE was originally built in 1969 for Lufthansa Cargo as a model 330C - construction number 20124 and line number 806. This meant it was an original cargo version with a large side mounted cargo door and strengthened floor with a roller-deck handling system. This also meant it was constructed without the cabin windows which many other 707s still had when they were converted to freighters from former passenger carrying models. The airplane was originally delivered to Lufthansa in May 1969 as D-ABUO, then transferred to their subsidiary German Cargo in November 1978, when Lufthansa split their flight departments to differentiate between passenger and freight operations. Challenge Air Transport bought the airplane in October 1984 and registered it N707HE. 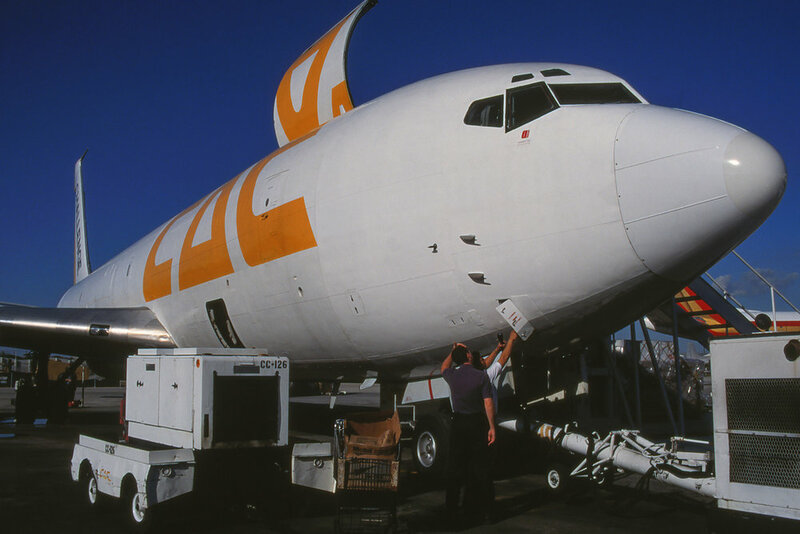 Re-named as Challenge Air Cargo in 1987, the company continued to operate N707HE alongside 3 Boeing 757s until 1998. Eventually the 707 was replaced in the fleet as Challenge began to acquire Douglas DC-10s on lease, and N707HE was sold to Omega Air to find a new mission as an air-to-air refuelling tanker under various military contracts to the US DoD. The engines on N707HE were Pratt and Whitney JT-3Ds, but during the early 1990s operators were obliged to install Comtran modification kits to these engines to ensure compliance with stage 2 noise regulations. These can be identified on this particular airframe by the lengthened intake cowlings and extended tail pipes. These changes ensured the 707 could remain in service whilst satisfying the new noise requirements. The airplane has subsequently been re-engined in 1999 with the later Pratt and Whitney JT8D power plants following its sale to Omega Air. 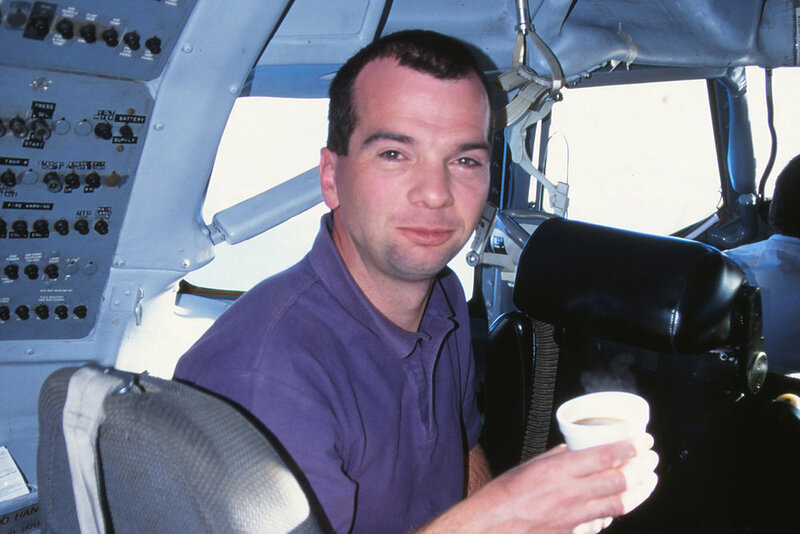 When I flew on the airplane in March 1996,it was 27 years old. There were zero defects and snags reported on the airframe. Not one circuit breaker was pulled, and no items were listed as inoperative, nor were any items written up for attention for maintenance when the airplane returned to Miami. The only thing it needed was fuel and more Coke cans to stock up the cool box. Testament indeed to Boeings original design and Challenge Air Cargos engineering crew. Captain Carlos "Speedy" Gonzalez and FO Brett Ramirez review the fuel burn calculations as we coast out over the south west of Cuba. Throttle levers noticeably staggered as we are established in the cruise at FL350 - a common feature on older airplanes such as this with a direct mechanical linkage between cockpit and power plant. With eternal thanks to Captain Carlos "Charlie" Frias (retired), his crew and Challenge Operations 1996.